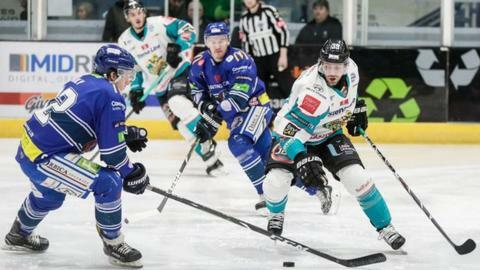 The Belfast Giants moved to within two points of Elite League leaders Cardiff with a 7-2 win over Coventry Blaze. Patrick Dwyer's first period hat-trick and strikes from Jonathan Boxill and Jonathan Ferland put the Giants firmly in control at the Skydome. The hosts pulled goals back through Alex Nikiforuk and Ben Larke before Darcy Murphy and Colin Shields scored late for Belfast. Coventry are still not assured of a play-off spot with two games remaining. At the top of the table, Cardiff know that wins in their final two matches will see them retain their regular season title. The Devils, who fell to an unexpected defeat by the Dundee Stars on Sunday, host MK Lightning on Saturday before travelling Coventry the following day. Defeat in either of those games could open the door for the Giants who will bring their season to a close with a home double header against Fife and Dundee. On Wednesday Adam Keefe's side knew that only a win would realistically keep them in the title hunt. The Giants dominated the opening period and scored after just five minutes with Dwyer impressively batting the puck out of the air. Dwyer doubled his and the Giants' tally at 9:16 when he and Blair Riley combined well before Boxill gave the visitors a three goal cushion after picking up on the rebound to slot into the roof of the Blaze goal. Boxill then dropped the gloves with Coventry's Kevin Noble at 18:33 when the Blaze player put in a late hit on Lewis Hook. Belfast picked up where they left off in the opening period when Ferland slotted home at 21:17, assisted by Chris Higgins before the hosts pulled one back through Nikiforuk. Ben Lake made it a three goal game at 41:05 when his shot from the blueline found the back of the Giants net, giving the hosts just enough hope to pull their goalie as they went in search of an unlikely comeback. The Giants took advantage of the empty net through Murphy, who fired in his record breaking 46th goal of the season, setting a new single-season record for Belfast. Shields, in his first game since announcing his plans to retire at the end of the Elite League campaign, rounded off the scoring late to seal an impressive win.